“She’s a Christian? Really?” That’s the most common response I get when I mention my current book project, a religious history of Hillary Rodham Clinton. Often the tone is one of curiosity, but sometimes there’s more than a touch of sarcasm. Why, then, does her religiosity fail to register with so many Americans? As an historian of American religion, I’d like to suggest that context is important here. Her religious dialect, one shaped by the progressive Christianity of the 1960s, is not easily translated into the language of the Religious Right, the dominant language of faith and politics in America today. As a young girl growing up in the 1950s, Hillary attended the Methodist Church in her upscale suburban community of Park Ridge, IL. Both of her parents were devout Methodists, but they understood their faith in different ways. Her father, a gruff and emotionally distant figure in Hillary’s life, was a “self-made” businessman who privileged individualism and self-reliance. His politics followed suit; he was a stalwart Republican and ardent anti-communist. Her mother, however, embraced a social justice tradition that was also deeply rooted in American Methodism. She was not alone; at Park Ridge Methodist Church, the women of the church lived out their faith by raising money for global mission work, assisting local migrant workers, and educating themselves about racial and economic injustice. For these women, sacrificial pursuit of the common good was central to their understanding of their faith. Hillary was caught between these two visions of civil religion. It was during her teenage years that she came to embrace her mother’s social vision. The primary catalyst for this arrived in Park Ridge in a sporty red convertible. Don Jones, her church’s new youth pastor, sought to awaken the young people in his charge from their privileged complacency. He took them to hear Martin Luther King, Jr., speak in Chicago, and he had them meet with black and Hispanic youth in the city, opening their eyes to a world very different from their own. Jones’s radical faith eventually proved too much for the more traditionally-minded leadership of the Park Ridge church (though the women in the church viewed him more favorably), and he only stayed two years. But he had a profound influence on Hillary, and remained her close friend and spiritual mentor until his death in 2009. As she left home to begin college at Wellesley, Hillary’s faith continued to be shaped by this progressive Methodist tradition. Upon her high school graduation she received a gift subscription of motive magazine from her church. 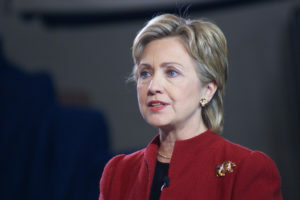 The magazine of the Methodist Student Movement, motive was a leading voice of progressive Christianity during the critical decade of the 1960, and Hillary read each issue religiously. She credits the magazine as one of the key factors in leading her to abandon her Republicanism and in favor of a Democratic vision of politics. The pages of motive reveal the contours of a progressive Christianity that seemed, amidst the turmoil of the 1960s, to represent the future of American Christianity. It was a faith that sought to move beyond liberalism and fundamentalism.Drawing on Bonhoeffer, Niebuhr, and Tillich, writers in motive sought a new articulation of the Christian faith suited to the changing world in which they lived. It was a faith shaped in the crucible of the Civil Rights movement. Dozens of articles depicting Civil Rights as a moral and spiritual cause appeared in the pages of motive. It was also a faith rooted in a tradition of global Christianity. This global orientation led writers to reject Cold War politics and instead connect the American Civil Rights movement to struggles for liberation across the developing world. Calling on the church to act against oppression at home and abroad, they shared stories out of Vietnam, South Africa, and Latin America that belied the myth of America as a “Christian nation,” and offered a prophetic critique of American hegemony and global capitalism. By the end of the 1960s, however, this tradition of progressive Christianity was coming undone. Similar in some ways to the dissolution of the New Left, the Student Christian Movement unraveled in the early 1970s with astonishing speed. Wracked by institutional and ideological conflict (particularly concerning the relationship of the sacred to the secular, as well as around issues of sexuality), progressive Christianity was in disarray. By the mid-1970s, evangelical Christianity emerged as the dominant articulation of American civil religion. On issues of capitalism, anti-communism and other foreign policy issues, the role of government, the virtues of patriotism and the very idea of “Christian America,” feminism, and in some cases, on the merits of the civil right movement, evangelicals offered starkly contrasting views of a Christian approach to politics. As abortion became an increasingly contested and politically polarizing issue, it drove a further wedge between many progressive Christians and conservative evangelicals. 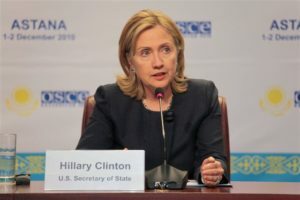 Hillary’s own faith didn’t remain frozen in the 1960s, nor can all of her actions been understood as the unalloyed expression of her religious convictions. She has gone through periods of doubt and spiritual exploration over the course of her life. But progressive Methodism has remained at the heart of her spiritual identity, and if one has ears to hear, it remains at the center of many of her political commitments today. What difference does it make if Hillary Clinton is a Christian? Electorally, overall favorability ratings tend to be linked to a candidate’s perceived religiosity, so it’s probably in her campaign’s interest to fight misconceptions about her lack of religiosity. But as history demonstrates, Christian belief can inspire widely varying political and social views. As Jeff Taylor pointed out in his thoughtful post on iAt, Christians would do well to keep in mind that the faith of a candidate may not be the most important factor in decided whether or not to vote for them. And yet, at a time when younger generations of American Christians are increasingly abandoning the politics of Religious Right, and when a large number of conservative, church-going evangelicals find themselves unable to support the likely Republican nominee, the time may be ripe for broadening our understanding of the variety of ways that Christianity informs conceptions of the social good and shapes the landscape of American electoral politics. In All Things is a journal for critical reflection on faith, culture, art, and every ordinary-yet-graced square inch of God’s creation. We want to expand our imagination for what the Christian life—and life of the mind—can accomplish. In pursuit of this end, we will engage in conversation with diverse voices across a wide range of traditions, places, and times. In pursuit of these aims, In All Things hosts essays, reviews, and devotional pieces that seek to explore the concrete implications of Christ’s presence in all facets of life. Previous Post"What do we Know about Hillary Clinton's Religion? A lot, Actually"